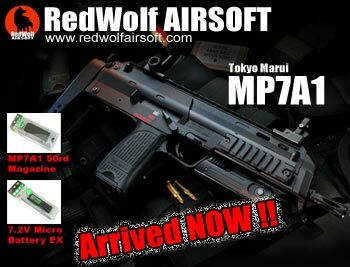 You are here: REDWOLF > Home > News >News Detail - Tokyo Marui MP7A1 JUST ARRIVED!!! Breaking news! The very first batch of the Marui MP-7 (airsoft MP7) has been arrived the RedWolf warehouse just an hour ago. Package includes the gun, a standard 50 round removable magazine, 7.2V micro battery EX and 110V EX charger. We are accepting orders worldwide. Demand is tremendous so order now to secure yourself one. BUY NOW! The MP-7 is designed as a compact submachine gun, with the magazine being inserted into pistol grip, and folding forward grip with retractable stock. All these features are ideally replicated in the Tokyo Marui's model and make this a perfect backup weapon, or a primary CQB weapon! Being a high performance submachine gun, the MP-7 real steel is exceptionally lightweight (1.7kg), and Marui's replica (1.4kg) comes pretty close. The gun can be fired single-handedly, or with two hands, either like a pistol or as an SMG when using a front grip. Retractable stock can be extended to give additional stability. With stock and front grip collapsed, the MP-7 can be carried like any big pistol and is super compact - perfect as a full-auto backup weapon (can be holstered like a sidearm!) For skirmishes, the MP7 is great for shooting around corners and spraying your opponents to the moon! Tokyo Marui 50rd Magazine for MP7A1 (TM-MAG-MP7A1) - Already in stock!! Tokyo Marui 7.2V Micro Battery EX (TM-BAT-72EX) - Already in stock! !